This is an entry for Retro Studio's Spring Love Contest. I really had intended to submit this sooner, but with the semester about to finish for me I've been really busy trying to get caught up on my still life painting and 3D Modeling assignments @_@ I don't know about anyone else, but this semester seems to have flown by ridiculously fast. This wallpaper was a bit odd for me because unless you count the individual petals that I painted in front of Shana & Yuji, I only used two scans total. Since the wallpaper had to be old-school extraction I had a hard time finding a picture of a couple to extract that didn't end with me wanting to vector it... I've always loved this scan of S&Y (because I think they're adorable <3 ), but I had no idea how to go about a background for them... until I found the cherry blossom scan. The background kind of makes me think of Misaki City from Shana's anime- especially with all the scenes of Yuji walking through the cherry blossoms, so I wanted to try it out. The background was so huge I positioned it how I wanted it without it looking just like the original background, and then painted the girl and her bicycle out of the image. I spent an absurd amount of time cleaning the scan of Shana and Yuji so that it didn't have the scanner dots all over it, and touching them and the bg up with painting and smudging to give them a similar style. Honestly, this took me far longer than if I had tried to vector it.... another reason I tend to get bored with basic tracing vectors now, I guess. I also had to draw in more of Shana's skirt and hair because the original scan crops it off. Lastly, I filtered it with different colors to get a nice, consistent hue across the piece. The second version from the top has the lyrics I mentioned above on it. Browse Shakugan no Shana Gallery: Recent | Popular. wow its something...happy, and bright..but it is an amazing wall. Colors pop out without being over the top and the shading is perfect. Cute spring wallpaper! Great job on it! Thanks for sharing with us. Great spring colors, it's so vibrant and cheery looking. of the quality, I want to say you really did a nice job trying to fix it. LOL, I'm loving this! Our 2nd entry! nice very very nice wallpaper! i like it! good work! sweet~~ XD the sakura petals are very nice! I adooooore <333 The colors blend together so well and I think its great you didn't change Shana's hair color :p It looks so clean too, you did an awesome job! shana is very cute! thx for sharing it! Love the warm tones and colors. 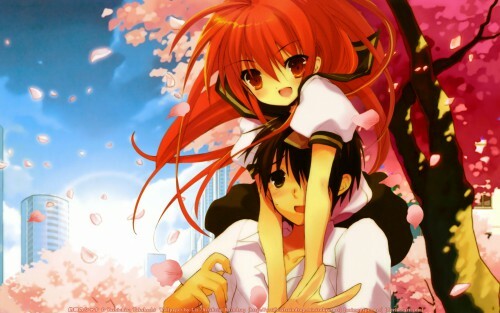 shana x Yuji is teh best laav team!